Most of us who have been through therapy got there because of trauma. This is often not one traumatic incident, but a series of incidents or chronic abuse, violence, neglect, etc. Many of us ended up in therapy because of emotional wounds from emotional, physical, or sexual abuse (or some horrific combo of them) in our childhoods. I view therapy primarily as the healing of the emotional wound caused by trauma, acute or chronic. If you have been through therapy, you know exactly what I mean. Often I witness people who have been through therapy decide to return to therapy, despite feeling like they are done. The confusion about not feeling good, or struggling with situations in life that they think they should be able to handle, drives them back to analyze themselves further. This to me is like the old joke of when you have a hammer, everything looks like a nail. Most of our collective understanding and awareness of trauma healing focuses on healing the emotional wound, and so that is often all we know to do. Human beings are complex, with multiple layers of existence – we are not just collections of emotions. 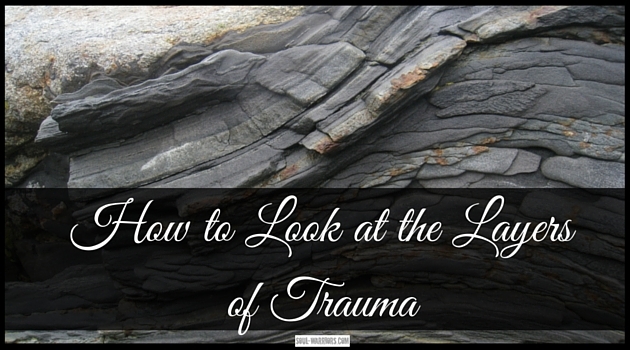 While I believe that healing the emotional wound of trauma is the first and most critical step for most people, there are additional layers that need to be addressed if we want to be completely free of trauma’s effects. Physical: of course this includes any physical harm we’ve experienced, but it also includes the physical effects of living with our fight, flight or freeze systems in an overactive state. 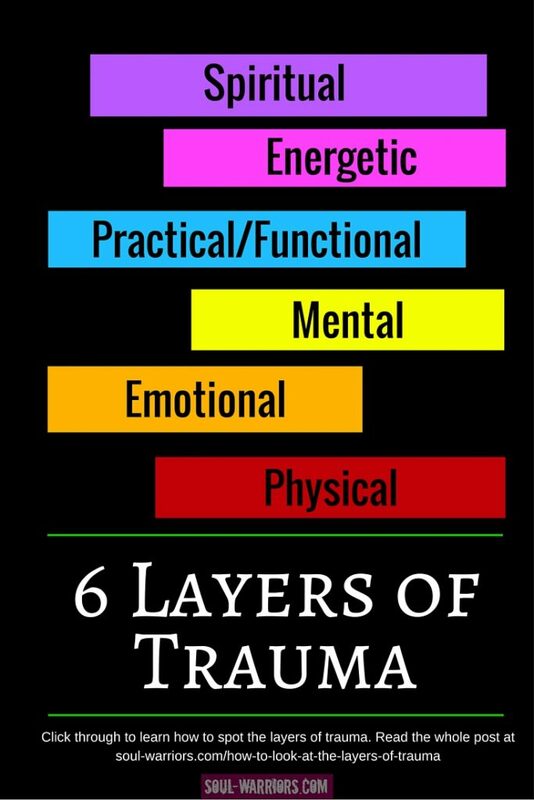 David Bercelli (TRE) and Peter Levine (Somatic Experiencing) have both contributed excellent work to this area of trauma recovery. Emotional: this includes emotional wounds from trauma, the compulsion to repeat them, and all social relationships. In my mind, therapy has no competition for healing this layer of trauma, and I believe it is the most important place to start. Once you are emotionally well, you can calmly assess and handle the other areas that you still need to heal. Spiritual: a trickier and less discussed area of trauma, this can include wounds in the inability to believe in a higher power, the sense that the world is a terrible, unsafe place, and other, less easily defined wounds. It can also include subjugation of your will to a religion, abuse by a religious figure, and a distortion of your sense of self as a perfect, holy being. Honestly I’ve yet to encounter someone who does not have some lingering spiritual trauma residue if they have experienced trauma in their lives. Healers for this one are also a little bit harder to come by. I like the work of Reverend Erin-Ashley Kerti (SpiritualMechanic.com) – especially her work on forgiveness. You might find wisdom in A Course in Miracles, the work of Marianne Williamson, or an individual coach or healer- like me – who loves God and is able to clearly reflect your divinity back to you. For wounds of this nature, I highly recommend praying that the person/book/experience you need be delivered to you and then keeping your eyes peeled. Energetic: this is possibly the hardest thing to put into words – wounds in your energy body, meridians, and aura that result from trauma. This is particularly hard to discuss because often traumatic residue in your energy system shows up as you feeling like something is “off” – a vague, uneasy, something-is-wrong-but-I’m-not-sure-what sense. If you find a credible energy healer, they are worth their weight in gold. Many of them operate without websites, solely by word of mouth, and sometimes you will have to go through a series of people who appear to be complete quacks before you find the real deal. You will absolutely know when you find one, and I promise it is worth the hunt. Practical/Functional: this is some combination of all five layers…and yet it has a life of its own. This is especially true if your trauma was in childhood – many of the life skills that functional parents taught their children completely missed you. You cannot worry about learning how to budget or cook when you are wondering if you or another family member is going to be killed. It’s often easiest to understand the multiple layers by seeing a specific example. To do so, I’d like to share my own layer-by-layer story of codependency recovery with you. I feel like I was a codependency poster child. As an example, at 22/23 years old, I encountered a homeless man demanding a kiss outside of a 7-11 and – for the very first time in my life – it occurred to me that I did not have to actually comply with a demand, just because someone made one. I could say no. 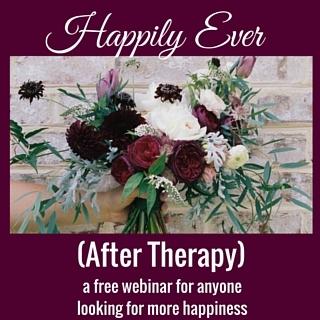 I dealt with codependency and that desire to “make everyone happy” so that I could be happy first in therapy. Lots and lots of therapy. I had no idea how to have healthy interdependent relationships that included both give and take between functional, whole people. I healed the wounds of needing to be fixed and needing to fix in therapy. First, I had to sort through my weird, twisted beliefs about myself and the world. While some of that was handled in therapy, many of my old thought patterns were left. This type of wound permeates your whole being, and so I found random bits of this all over my thought processes. A small example – I used to always, without fail, offer to let people go in front of me in grocery lines who had less than I did. I did not do this because I’m a kind, generous person. I did this because at the core I thought if I were kind, no one would be mean to me. This is a tiny, silly thing, but it demonstrates how pervasive thought patterns can be. Today, when I offer to let someone go in front of me, it’s out of genuine care and from a place of abundant generosity instead of lack and fear. I had to start taking steps that honored my true desires when it comes to shared space, time together and time apart. I had to recognize that offering to let friends stay with me for multiple nights (while I of course insisted on sleeping on the couch) was not coming from a place of heartfelt joy – it was coming from fear that they would ditch me if I didn’t offer. I had to learn my practical boundaries, even though they fly in the face of much of my “good person” programming. Each person has free will – and that includes the choice to be unhappy, in pain, hurting themselves and others. It is not my job to fix the pain of the world. It’s my job to fix my own pain, and be available to help others when they ask me to. This layer was the hardest to face, because the problem itself is not ‘generally accepted’ to even exist. I have an energy system that is capable of popping out and visiting other people’s energy systems, often taking some of their pain and ick back with me for processing. This probably served me quite well in childhood and many other situations in my life. Now, when functional and safe, this pattern is a problem. I do not want to be in other people’s energetic business. I do not want to be processing other people’s pain without them asking me to. It’s not helpful to me or them. I’ve spent years reading and researching this topic. To help with my own patterns, I hired my dear friend and awesome coach Caroline Van Kimmenade of thehappysensitive.com, who is helping me detangle my energetic threads from those of others. I’m close to clearing out codependency from my entire human system (and that is really exciting!) As you can tell, it took years, a lot of work and – most importantly – the willingness to keep looking for the next solution. This is what I help clients do too, and it is why I’ve created a practice focused around post-therapy healing – because we deserve the full breadth of healing that is available to us, and support in getting there. In my mind, therapy is the truly hard work. Once you’ve done that, the rest of this is cake in comparison – but if you don’t know it exists, you can start thinking therapy didn’t work or you need more of it. 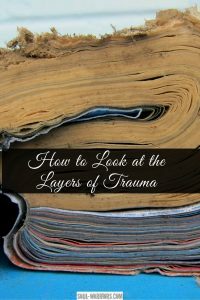 I invite you to look at your own trauma and see which layer might need more attention and set an intention to heal that layer. If you would like some help with this, sign up below to learn more about my work and how I can help you. Here’s to your whole, happy self!